Destined For The EU & UK Market In 2021. Back in 2016, the PSA Group (the parent company of Peugeot and Citroen) announced its intentions to launch a global one-tonne pickup truck to rival the likes of the Toyota Hilux and Ford Ranger. And in late 2017 PSA announced that they would be developing the pick-up in conjunction with Chinese manufacturer ChangAn. Recently ChangAn has revealed prototype images of its next-generation model, the Kaicene F70. And this could be our first look at what the new Peugeot will look like. The Peugeot pickup truck is currently being developed and is due to hit European showrooms in 2021. You may be surprised to know isn’t Peugeots first venture into the pick-up market. It’s been over 20 years since Europe last saw a Peugeot branded pick-up on European soil, in the form of the 504, but up until recently Peugeot have also produced the ‘Hogger’ for their South American market. They have also currently selling a pick-up on the African market, which is very simply called Peugeot Pick Up. This is then a simple rebadge of the Dongfeng Rich. Dongfeng is PSA’s major partner, responsible for the production of PSA brands Citroën and Peugeot. If the new pick-up follows the same basic dimension as the Kaicene F70 it should be shorter in both length and width than a Ford Ranger but also slightly taller. The Chinese models have 2 drivetrain options, a 1.9 and 2.5-litre, both coming from Isuzu. 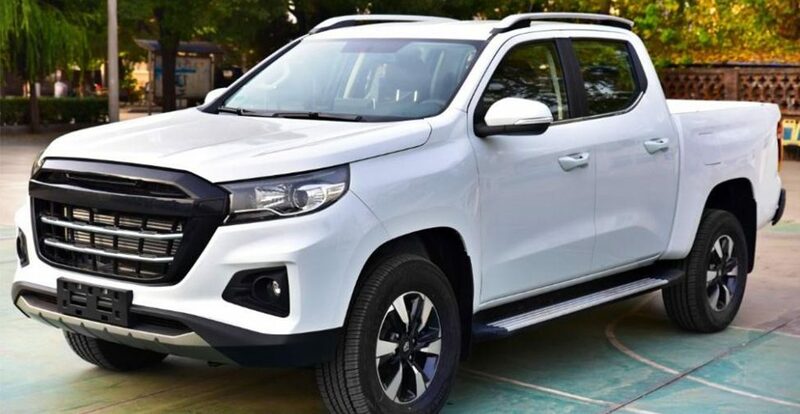 The new pickup is expected to go into production in China at the start of 2020, and available to Chinese customers first. The European models aren’t expected to arrive into dealerships before 2021.